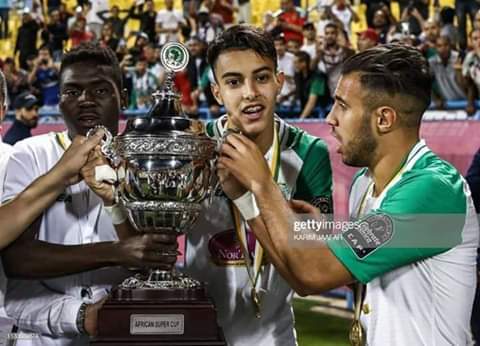 Forward Muhammad Shaban became the second Ugandan to lift the CAF super cup when his Moroccan out fit Raja Casablanca defeated Tunisian side Esperance 1-2 in Qatar on Friday to be crowned 2019 champions. Goals from Abdelilaha Hafidi and Badr Banoun were all that the Casablanca based side needed to scoop the precious trophy with Mohamed Youcef Belaili finding the consolation for the 2018 CAF Champions winners. However, in this encouter, Muhammad Shaban was unused substitute. The CAF super cup is played between the winners of the CAF Champions League and CAF confederations cup respectively. Mamelodi Sundowns skipper Denis Masinde Onyango was the first Ugandan to achieve the milestone in 2017 when they defeated DRC giants TP Mazembe 1-0 to lift the Super Cup trophy.